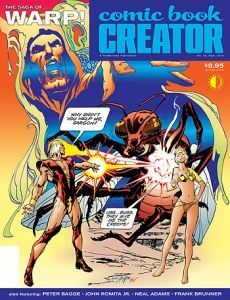 With a choice of two covers on either side of Comic Book Creator # 10, the one that attracted me the most was the one was the tongue-in-cheek ‘Warp’. I principally knew of it from one of the first Neal Adams’ early artbooks where he showed some sample art he did for their costume designs. With this tenth issue of ‘Comic Book Creator’, you get to see more of Adams’ work and that of the production itself. The three part ‘Warp’ play was created and performed in Chicago before having seven performances off-Broadway in New York before closing, having been panned by critics who didn’t get it. Such was life in those days. Seeing some of the success that followed the people involved like director Stuart Gordon and actor Keith Szarabajka, who got elevated from understudy to lead because of injury to the original lead. From reading this long article, it’s clear that ‘Warp’ was ahead of its time, simply because all the elaborate stage effects had to be done by hand long before they could be computerised. I suspect if it got revived in this techno age, it would still have to have a serious overhaul but gave an interesting account of the early 70s. By far the biggest amount of space in this issue is devoted to underground comix writer/artist Peter Bagge, who as I discovered from reading is probably the source for coming up with the name ‘alternative comics’ so perhaps the identifier could be altered. Although I looked at some early undergrounds when young, I never really got hooked, mostly because I never understood this American sub-culture and its drug references and down-and-out culture. Interestingly, Bagge was never into the drugs but just found a niche for his ideas and something that wasn’t super-hero. Oddly, in the late 90s, he’s parodied Spider-Man and the Hulk and worked for both Marvel and DC Comics as well as a writing film properties that never get made. There are a lot of samples of his work and I loved his condom gag. I’m always a sucker for creator interviews and Bagge certainly supplies a lot of interesting material about the people he’s worked with and liked, including Robert Crumb, not to mention the various alternative publishers. He even confesses that his ‘Hate’ comic was a badly chosen title but has lived with it. Although the insights aren’t likely to win me over to the material, the insight made for a delightful read. ‘Comic Book Creator’ is a quarterly release from TwoMorrows Publishing, so it’s always worth seeing who they are going to cover next or who you missed in the back issues.